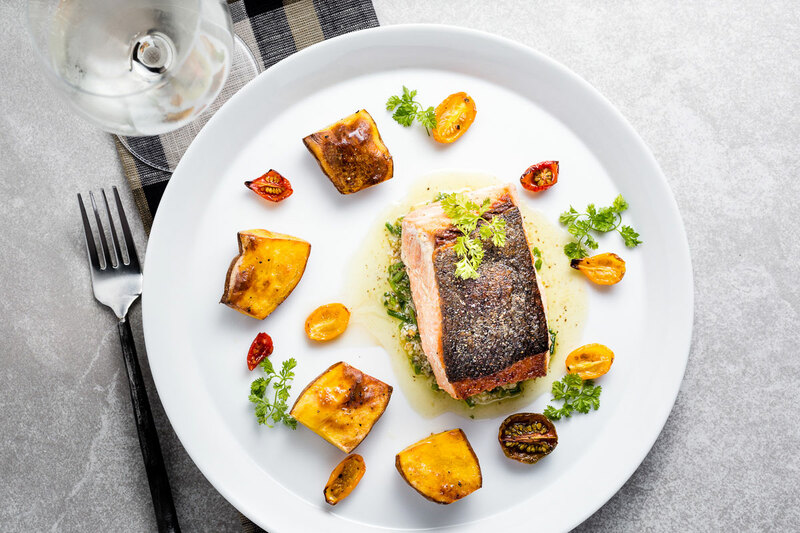 Pan-Seared Salmon with a fresh Chive-Walnut Pistou, Crispy Fingerling Potatoes and Semi-Dried Grape Tomatoes is a fish dinner treat you will want to repeat. 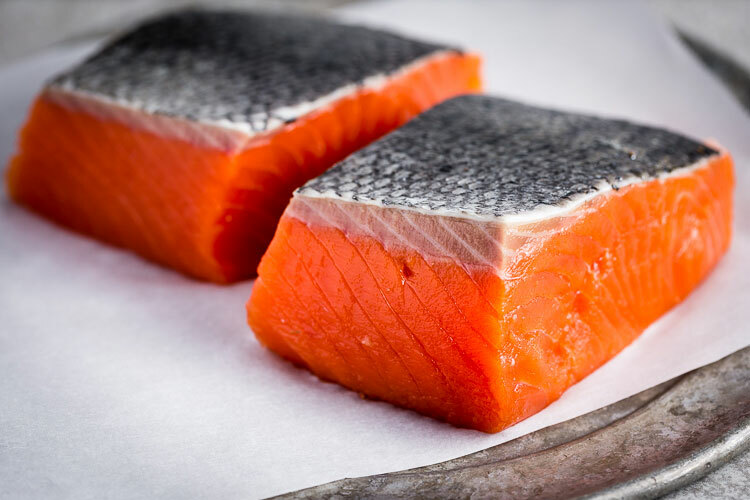 Wild Salmon is so diverse in its uses and it is so good for you. You can grill it, cook it on the stove or oven, smoke it, eat it raw, and the list goes on. My favorite way to prepare it is to pan-sear it in a hot pan and then finished in the oven after basting with a little butter. There are four elements to this dish. The salmon, the alaskan fingerling potatoes, the semi-dried grape tomatoes and the chive-walnut pistou. None are technical to make and all but the salmon can be made ahead of time. Everythign is beautiful together on the plate, and tastes delicious and balanced. When it comes to salmon, it’s all about the crispy skin. To get the super crispy skin, you need dry salmon and hot oil. 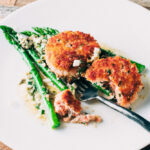 Right when those two come into contact, you can gently push the salmon down into the pan using a fish spatula, which will promote even more crisping. We’re going to use the oven for three elements of the dish. First to go in a 325 degree convection oven will be the semi-dried grape tomatoes and the alaskan fingerling potatoes. They should be on separate parchment-lined baking sheet pan and get the same treatment; a drizzle of olive oil and some salt & pepper. 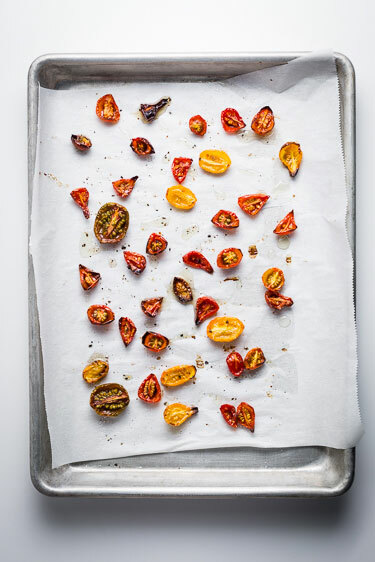 The reason for the separate sheet pans is that the tomatoes will probably finish before the potatoes, so this makes it easy to take them out separately. 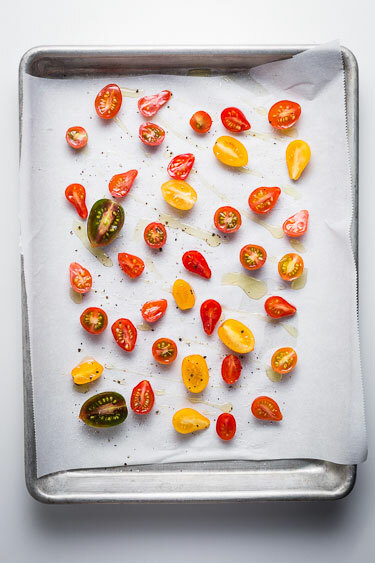 If you only have room for one sheet pan; you can use separate pieces of parchment paper to remove the tomatoes from the sheet pan when they are done. My father-in-law just returned from a fishing trip in Oregon and brought us this beautiful Chinook (King) Salmon that he caught. We have pretty much just been eating local fish to San Diego and haven’t had salmon all summer, so I was super excited. I always recommend buying wild salmon. 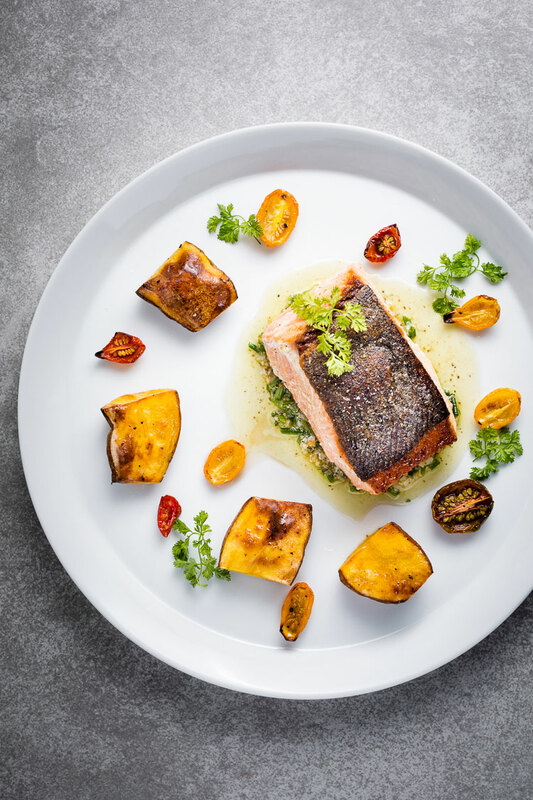 If you are used to cooking farm-raised salmon, it’s important to know that wild and farm-raised salmon cook quite differently, so they should be treated differently. Since farm-raised salmon spend their time in cage, they don’t get to swim around very much. At the same time, they are fed a lot so they grow quickly and can get to market as fast as possible. This means that their muscles are not as developed as wild salmon, and they are much higher in fat. For this reason, the wild salmon should be cooked less (by about 5 degrees Fahrenheit) than farm-raised salmon. 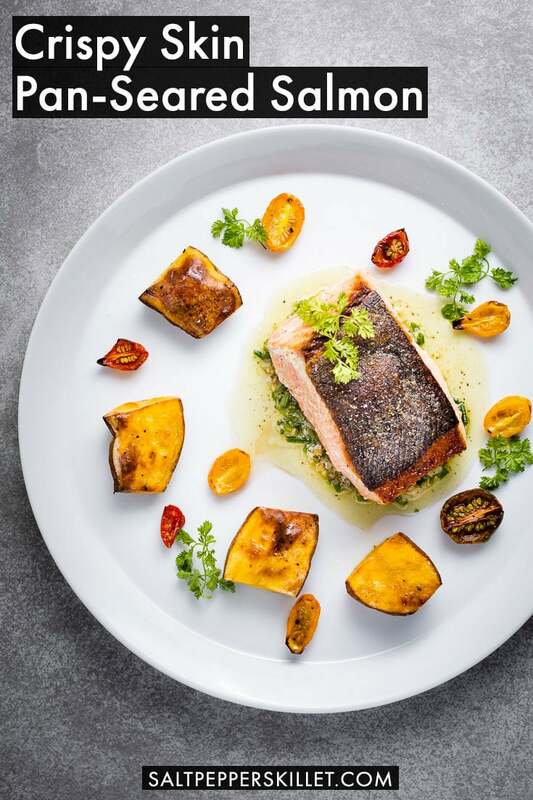 The optimal finished temperature for wild salmon is 120 degrees. Since Alaska is kinda synonymous with Salmon, I thought Alaskan Fingerling Potatoes might pair up with salmon quite nicely. Turns out that they work great together. I’m actually not even sure if they originate from Alaska, but it’s in the name, so we’re just going to go with it. These were grown by Weiser Family Farms and I picked them at Specialty Produce in San Diego. I love mashed potatoes with Salmon, and since these potatoes have such a nice creamy texture by themselves, it’s a nice substitute with a crispy outside without needing to do much with them. A little olive oil, s&p and into an oven for about an hour. It’s towards the end of the tomato season here, but they are still pretty available. I had some heirloom cherry tomatoes that weren’t quite at their peak, so I was looking to use them slightly differently. Semi-drying them in the oven concentrates their flavor and gives a bright pop to the dish, which goes really well with the salmon, potatoes and the chive-walnut pistou. The chive-walnut pistou and semi-dried potatoes are inspired by Naomi Pomeroy’s beautiful Taste & Technique cookbook (affiliate link). 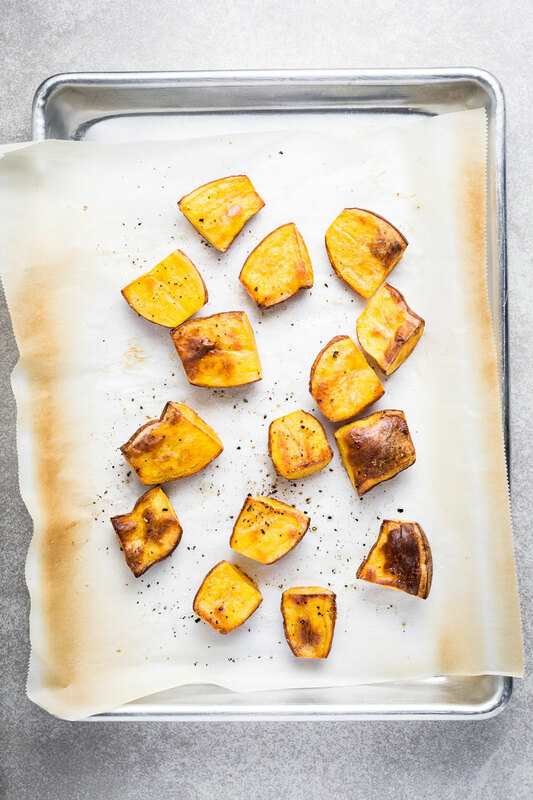 On separate parchment-lined baking sheets; place the potatoes and tomatoes cut side up. Drizzle with olive oil and season with kosher salt & freshly ground pepper. Bake the tomatoes for 45 minutes to an hour, and the potatoes until they are golden and become somewhat soft and cooked through. Using a hand blender or a blender, pulse the walnuts to break them up into small pieces. Add the parmesan cheese and the garlic. Blend to fully incorporate. In a small bowl, combine the nut mixture with the chives and olive oil. Season with salt & pepper, adding more olive oil if needed. Increase the heat of the oven to 350 degrees after the potatoes finish cooking. Heat some olive or canola oil in a heavy-bottom skillet. Pat the filets dry with a paper towel and season the salmon on both sides with salt & Pepper. 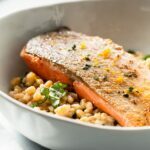 When the oil begins to shimmer and just starts to smoke, carefully place the salmon filets skin side down into the skillet, then gently press them into the pan with a fish spatula to promote crisping of the skin. Reduce the heat to medium-high. Using a fish spatula, turn the fish over after about 3 to 4 minutes, depending on the thickness of the filets. Be careful to get the spatula completely under the skin to keep it in tact. Add butter to the pan and let it melt. Use a spoon and baste the melted butter onto the salmon filets. Cook on the flesh side for about 1 minute, then place the skillet in the oven. After 3 to 4 more minutes, baste the salmon again with the butter and check for doneness. The optimal internal temperature is 120 degrees. 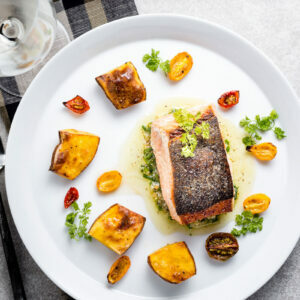 When the salmon is finished cooking, serve it with the Pistou sauce, tomatoes and potatoes. 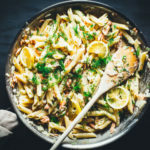 You can make this for 2 to 4 people with more salmon and the same amount of sauce. If you don’t have chives or walnuts, other herbs and nuts can easily be substituted fro the pistou. Beautiful Salmon!! I love the color of the raw salmon bright orange! The presentation is stunning, and It’s making me hungry, and I’m not a big salmon fan.